Pick anywhere on the planet and where your tires reach the water’s edge, the trail effectively ends. Sure, you can make a short crossing through a puddle or small pond, but only one vehicle can charge ahead with no worries. 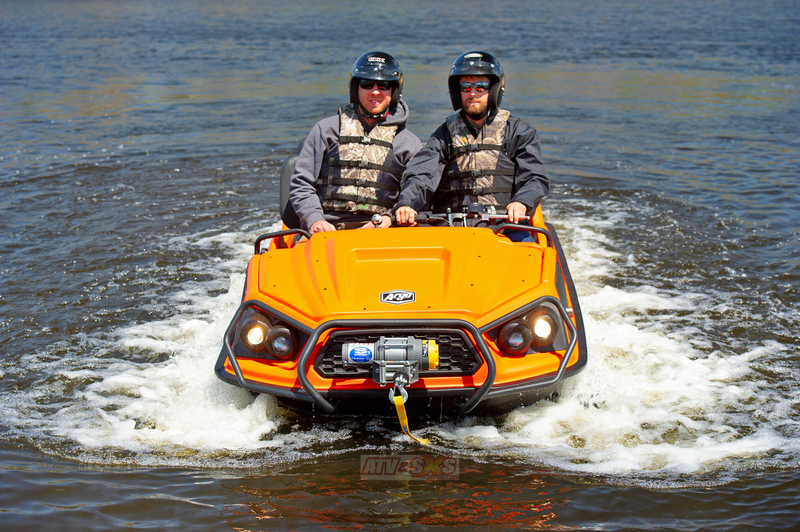 Where no Polaris, Arctic Cat, Honda, Can-Am or Yamaha will dare venture, the 6 or 8 wheeled ARGO dives in with no limits to what you can conquer, and it just so happens that wading into deep water in an ARGO is also ridiculously fun. Long the vehicle of choice for anybody who had wet, muddy, or otherwise impassable terrain to cover, the ARGO lineup is by far the most capable all-terrain-vehicle on the planet. Argo owners were less concerned with creature comforts and interior refinement, instead preferring the utilitarian aspect of hauling anything and everything over terrain that was impassable by any other means. With the new ARGO AURORA they might want to rethink that! When designing the new Aurora models, the goal was to expand the capabilities while at the same time increasing passenger and driver comfort. Designing the chassis for an amphibious vehicle is a little different than designing the frame of an ATV or Side x Side. With the Aurora, the bodywork actually serves as part of the chassis rather than the wrapping around it. It was designed for easier entry or exit, and a flat floor in the passenger compartment was a big part of that. At the front, an automotive style latching hood makes engine access easier, and on every model but the base model, Aurora 800 a front brush bar helps prevent trail damage. Brighter, dual high/low projector-style head lights and LED rear tail lights are tucked into the bodywork as well. At the rear is a handy hitch for towing. It is inside the Aurora models where the changes are most noticed. The steering stem and handlebars have been moved to the left side of the vehicle and it seems more natural in the new position. 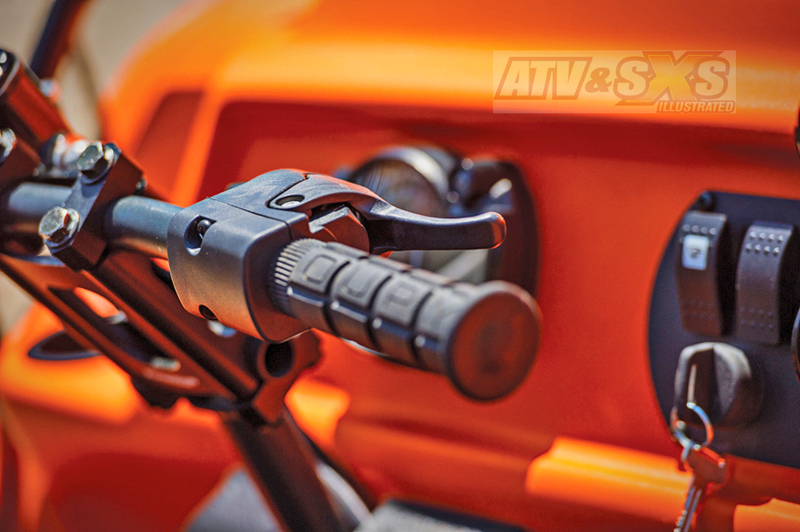 A huge improvement was made by relocating the shift lever to the dash panel rather than under it, and instead of the twist throttle common to other Argo models, all Aurora models use a watercraft style trigger throttle. This would be a great change for every Argo. On the left handlebar is a new, very familiar switch pod that controls the lights, starter, and ignition on/off switch. We are guessing this was a contribution from TGB, a company that is a manufacturing partner on the ARGO atvs. At the center of the dash is a new instrument panel with accessory switches and a new digital LED display. The new Aurora models are built to comfortably haul 4, with two rows of seats. The second row can be removed for more cargo space. Power for every Aurora except the top-of-the-line 950 SX model is provided by a 30HP V-Twin EFI Liquid Cooled Engine. The 950 SX is driven by a 993cc, 4-stroke V-Twin Briggs & Stratton Vanguard Marine engine with EFI and a 50 amp alternator. It has a load capacity of up to 921 lb. on land or 771 lb. in the water, and it’s capable of towing 1800 lb. / 816 kg. All Aurora models benefit from a little extra room under the front hood, and a firewall with added insultation to isolate engine noise. Chain drives underneath the floorboards keep the wheels turning, and all Aurora models benefit from new, heavy duty axles and bearings. Finally, the Aurora models ride on new, proprietary 25” “tires with either a steel rim or aluminum beadlock rims. The tires give better traction and a smoother ride thanks to lower pressure, and the beadlock wheels help keep them on the rim. The wheels can even be flipped around for adding tracks with no other hardware required! It was time to see what the new Aurora models could do and the first thing we noticed is getting inside is a little easier. The new bodywork is cut slightly lower where you climb in and out, making it easier to enter, especially for shorter riders, less mobile riders, or when wearing bulky hunting gear. From the driver’s seat, everything felt more natural, with all controls exactly where they should be. Argo gave the new Aurora models a couple features we were eager to try out. The first change we were happy to find is the new model can be started in gear as long as you hold the brake lever. The second major feature is a new steering system they call Argo Progressive Steering. The way the system works is, braking force is applied to each side of the new Admiral steering differential. It’s a triple differential transmission available in standard 6.2 or high torque 8.1 gear ratios that allow the vehicle to turn effortlessly even with tracks installed. 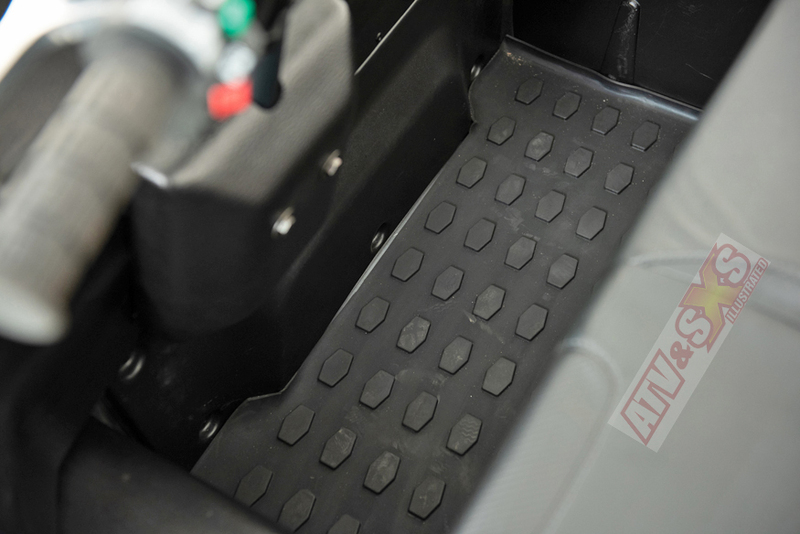 Hayes Brakes provided assistance in the steering brake system, and applying braking force to either side of the transmission allows for very smooth, consistent steering feel, much like every other UTV. APS is currently only available on the Aurora models but it is well worth the upgrade. No other UTV can match the feeling you get when you leave solid land and plunge into a pond with an Argo. For a brief moment, getting stuck too many times in everything else comes to mind, and we quickly glance at the standard Bilge pump button. 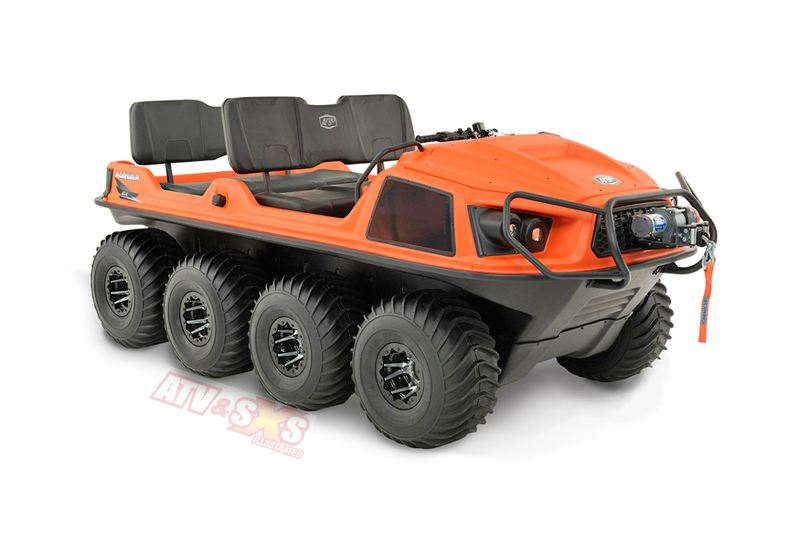 As the water gets deeper the Argo shows a capability no other UTV can match. Like a fat duck, it floats on top of the water, paddling its way to where you point it. The new tires were designed to not only improve ride on land but also increase the Argos performance in the water. Argo calls them their “mud and swim” tires. We like that name! As with previous Argo models we’ve tested, the Aurora models ride slightly nose down in the water. This was by design and all 8 wheels work better in this configuration rather than churning away in water that is already disturbed. Don’t expect to pull any skiers behind as top speed is someplace around 4mph, but it is enough to tote you, your shotgun and decoys, and an anxious retriever bent on grabbing a bird. Again, try that with any other UTV. On land, the Argo is incredibly stable, and regardless of whatever you are crossing there are some wheels in contact with the terrain to drive you forward. Top speed on land is approximately 25mph. Steering is vastly improved over previous Argo models, and we like the trigger throttle over a twist throttle. 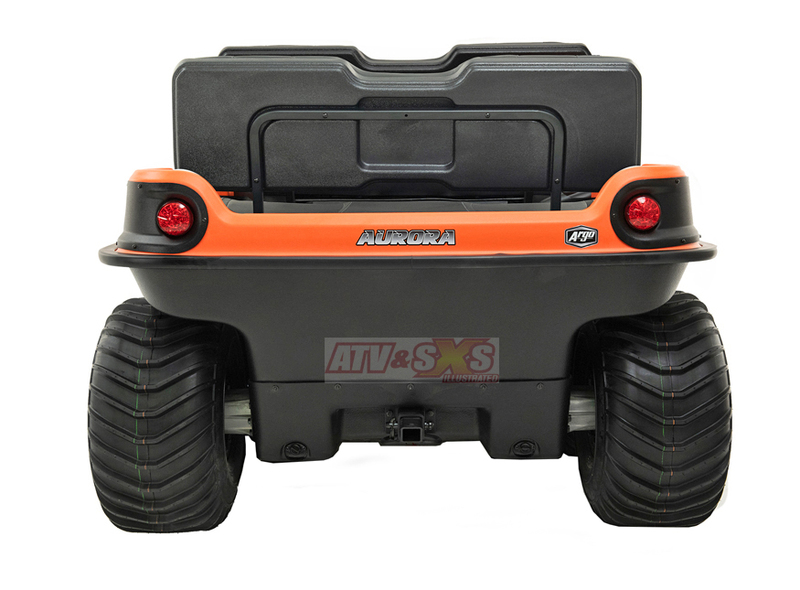 There is no suspension on the Argo other than adjusting tire air pressure. With beadlock wheels you can really drop the pressure to smooth out the terrain. 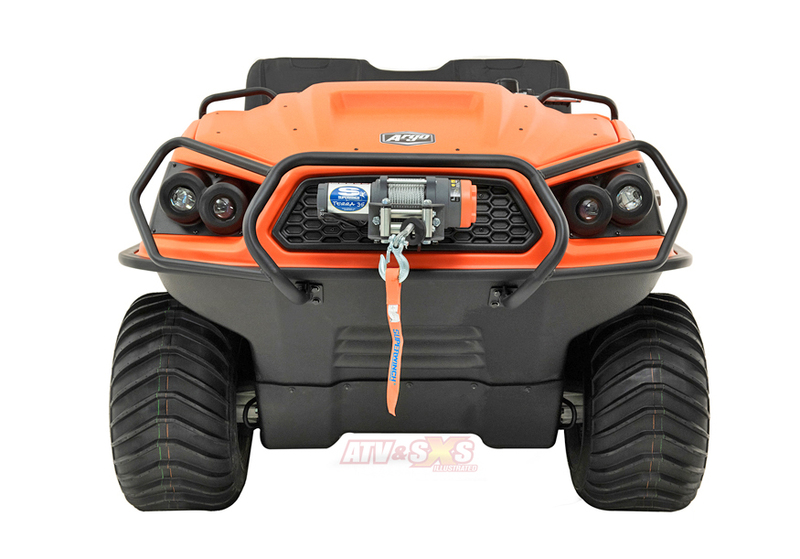 Should you get into trouble, and we can’t imagine what that would be with an Argo, the Warn winch mounted on the front will easily tow you, or perhaps your buddies Gator or Polaris out of trouble. 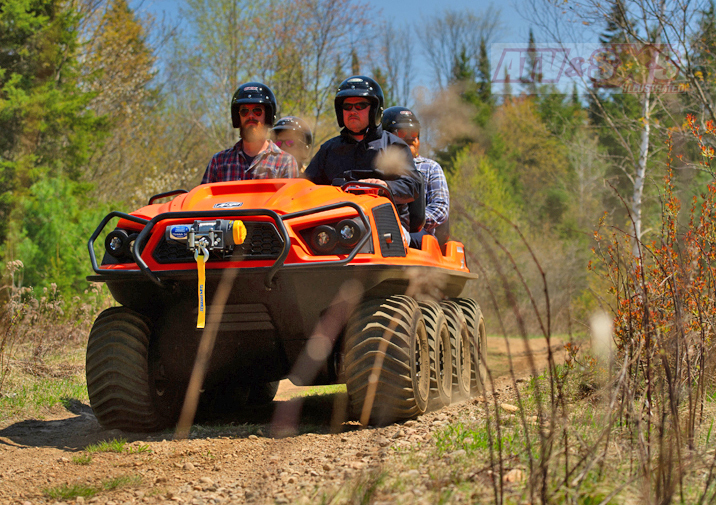 Every ARGO is an adventure machine. They simply beg you to find terrain to challenge them. 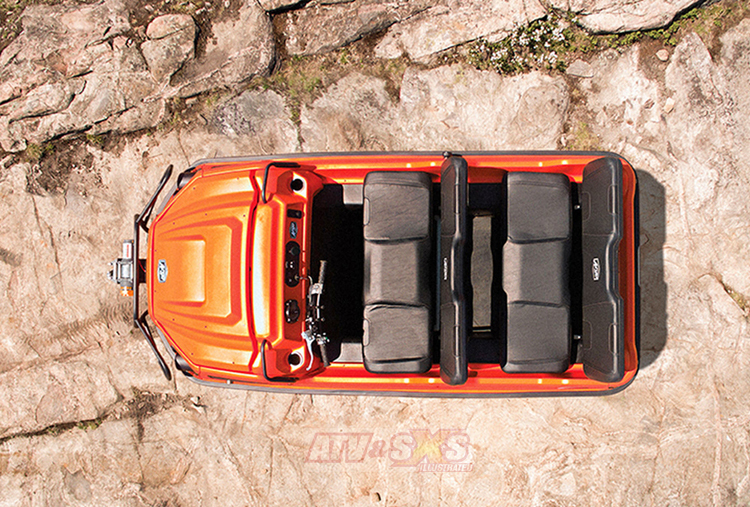 The new Argo Aurora models are the best yet, and there really is practically no limit to where they can go. When you’re after ducks or big bucks you need to go where they are. Go in an Argo. They can get you there. 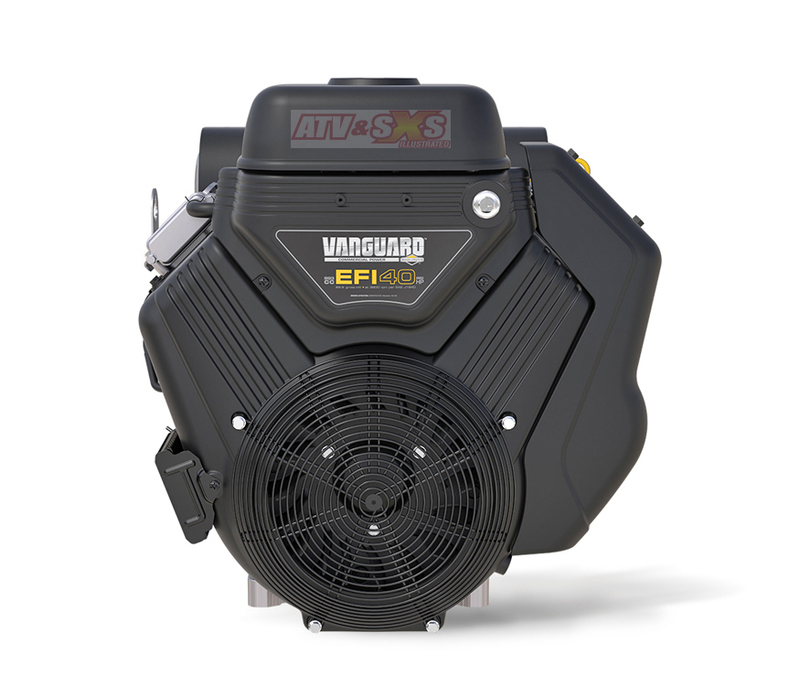 Engine: OHV V-Twin liquid cooled 993cc, 40 hp (29.8 kW) Briggs & Stratton Vanguard Marine engine with electronic fuel injection and a 50 amp alternator. 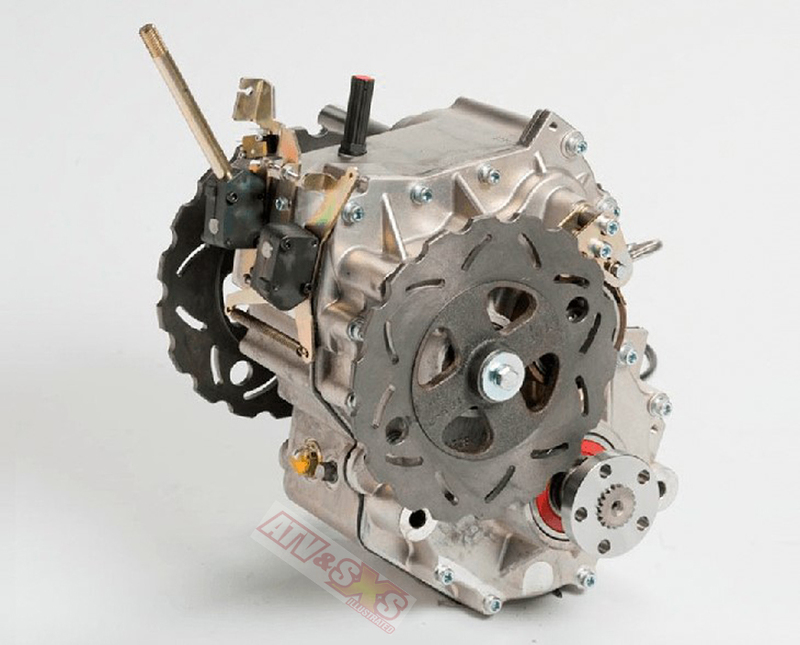 Clutch: Continuously Variable Transmission (CVT) belt drive to transmission. Transmission: ADMIRAL triple differential transmission in standard 6.2 or high torque 8.1 gear ratios; Forward, Neutral, Reverse. Frame: Formed steel channel construction, welded for high strength and durability. Body: Vacuum formed High Molecular Weight Polyethylene. Fuel Capacity: 7.1 Us gallons (27 litres) See-through polyethylene fuel tank. Instruments: LCD Digital Gauge Cluster Speedometer, Odometer, Voltmeter, Hour meter, Tachometer, Engine Coolant Temperature, Low Oil Pressure, Parking Brake Reminder lights and Check Engine Light.